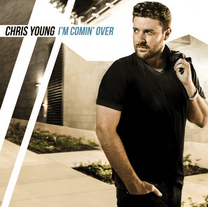 2 years after the release of ‘AM’, which peaked at #2 on the Billboard Country Albums Chart, Chris Young is back with his brand new project, ‘I’m Comin’ Over’, an album which Chris describes as “sonically different from anything I’ve ever put out before”. Leading up to the launch of this album, Chris gained incredible momentum with the release of the title track as the first single, which hit #1 on the country airplay chart – his first song to do this since ‘You’ back in 2011. Chris has been anything but an overnight success; his first album struggled sales-wise, but 5 albums in, he has built a solid foundation and is starting to establish himself as one of the heavy-weights in country music. Hopefully this will be his first album to reach that #1 spot. The album kicks off with ‘Heartbeat’, a very catchy pop-country track that lends itself beautifully to his live show. Right from the beginning, Chris draws us in with the sound of a heart beating which cleverly continues throughout the song, providing a real thumping back beat which just begs to be heard on stage. The chorus is truly anthemic and I’m sure it will become a regular feature on his set lists – you can’t help but sing along! This track has so much commercial appeal and it wouldn’t surprise me if this is eventually released as a single. ‘Heartbeat’ sets the tone for much of the album with its more mainstream-orientated sound. However, saying that, it does maintain that familiar ‘country’ feel that we love about Chris Young’s repertoire. There are also 2 duets on the album. The first is ‘Think Of You’, featuring Cassadee Pope (winner of The Voice USA 2012). According to Chris, there is “nobody better to sing on this track than her”, and when you hear their harmonies in the chorus, I’m sure you’ll agree! This is another track with so much commercial appeal, and it has been chosen as the second single from the album. There’s no doubt this will be another top performer on country radio. The second duet is ‘Sober Saturday Night’ featuring country legend Vince Gill. This is one of my favourites on the album, as it is certainly the most ‘country’ song you will find. It provides a welcome relief from the pop-country sound that makes up the majority of the album, providing a real sit-up-and-listen moment. It exposes the sheer quality of Chris’s vocals and in my opinion, displays where Chris is at his very best. This is one you definitely won’t want to skip. Another personal favourite is ‘Sunshine Overtime’, a very fun, laid-back summer track which is reminiscent of ‘Nothin’ But The Cooler Left’ from the previous album, ‘AM’. This is one that the fans will absolutely love – it’s one of those that requires sun, heat and rolled-down windows to make you fully appreciate it (It doesn’t have quite the same effect on a cold November day in England!). The intro is almost Florida Georgia Line-ish….I half expected Tyler Hubbard to come in singing “I’m gonna wear my flip flops and I’m gonna play some flip-cup…”! Chris saves the best till last with ‘What If I Stay’, a very warm, romantic track which is a drastic change from the album’s general style. No electric guitars in sight, no catchy hooks, just a beautifully written, acoustic-guitar based country classic. This is up there with the best music Chris Young has ever produced – it is so simplistic yet so effective and is a clear standout on the album. The stripped-back style of the track also allows Chris to show off his vocal talents, and the power in his voice hits you with a knock-out punch in the second chorus. ‘What If I Stay’ is similar to ‘Text Me Texas’ on the previous album, which was another favourite of mine. This track is simply superb – I would even say it’s one of the best I’ve heard this year (and 2015 has been a VERY good year in country). So, to sum it up, ‘I’m Comin’ Over’ is another solid release from an artist who continues to grow from album to album. With this release, I believe Chris has found a pop-country sound that really resonates with the fans and has bought him so much success with the first single from the album. However, he hasn’t gone over-the-top, and there is still that familiar, warm country sound that loyal fans love. There are no fillers on the album, every track has its place, and it is one of the best projects I’ve heard this year. It will be a favourite for many years to come too. Check it out, you won’t regret it.